Singer/songwriter Buck Johnson hails from the back roads of Shady Grove, Alabama, just outside Birmingham where he grew up singing Gospel throughout the South with his musical family. Since then he has performed in churches, bars, festivals and concert halls throughout the world. 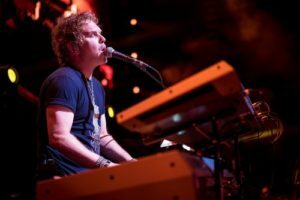 He is currently the keyboardist and backing vocalist for legendary rock band Aerosmith and has also toured and recorded with such notable artists as The Doobie Brothers, Tal Bachman, John Waite, Shawn Mullins, Matthew Sweet, Timothy B. Schmit of the Eagles and many more. As a songwriter, Buck has been influenced by the music he grew up with…namely Southern-Rock, Gospel, Blues and many English bands that were influenced by music of the South such as The Rolling Stones, Led Zepplin, The Beatles, and many others. Buck is excited about the release of his debut album, Enjoying The Ride, and is currently touring in support of the disc. The music showcases songs that reflect his life journey with all its ups and downs. Buck Johnson will be performing two nights in Northern Oregon to help celebrate the release. On Saturday, March 11, Buck Johnson will be at The Birk, 11139 Hwy 202, Birkenfeld for a 7:00 pm show. Tickets can be purchased in advance through Tickettomato.com for $20.00 or at the door day of show for $25.00. Then on Thursday, March 16, Buck will be appearing at Duff’s Garage in Portland at 9:00 pm. Duff’s is located at 2530 NE 82nd. Contact the venue for admission information 503-234-2337.